Over the past months it often occurs to me just how much has changed in my lifetime, so I’ve been thinking about this post for a while…must be a sign of increasing age. Doesn’t mean I won’t forget something, so please add your comments at the end, or join me and write your own post on the topic as your experiences may be very different. 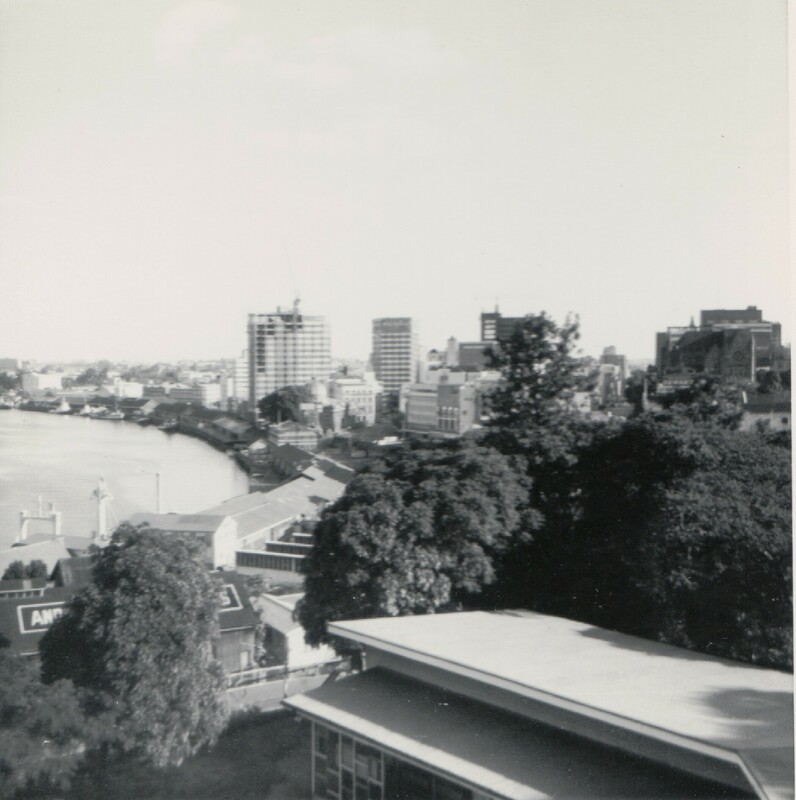 I grew up in Brisbane in Queensland as a number of my blogging friends did as well. I wonder how much our experiences will overlap and where they’ll differ. Voting and drinking were illegal for us, being under 21, but our brothers or male friends could be sent to war. Communism and Vietnam: Australia was still nervous about “Reds under the Beds” and suddenly wanted to go “All the Way with LBJ”. 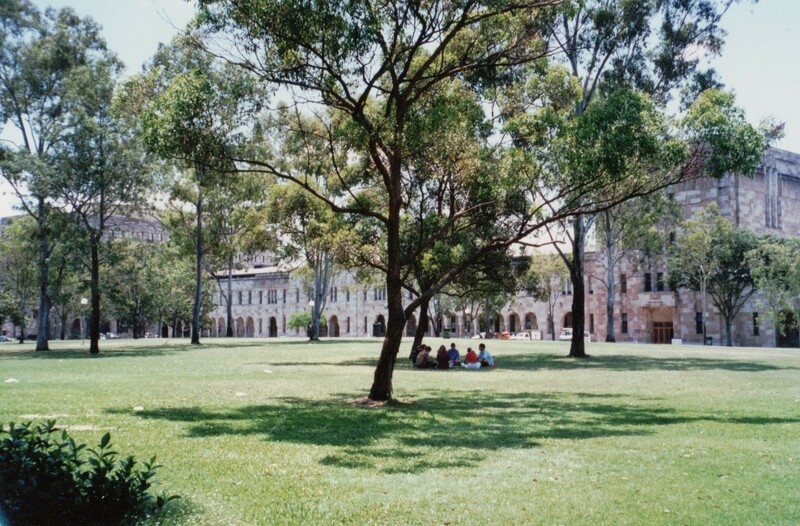 Universities were agitating over civil liberties, Australia’s presence in the Vietnam War and the enforced conscription of young men, who “won” the conscription lotto if their birthday was drawn out for a free excursion to the Vietnam War. Queensland was very conservative in all sorts of ways. Multi-culturalism hadn’t been invented as a concept, though the reality had arrived with the post-War immigrants. They retained national dress, dance and language for special events, and at home. Their influence was about to be felt in the realms of food as we were introduced to garlic, olives etc. Church: Many, if not most, people went to church regularly. Vatican II had arrived and Catholic women shed their hats for mantillas (a lace veil over the head). People started to think independently about their actions. The barriers between religions were still standing and most people were horrified at the thought of entering a different type of church. Brown or Asian faces were rarely seen in the city as Australia’s hideous White Australia Policy was still enforced. No one admitted to having indigenous or convict blood. Neighbours: whether you liked them or not, you knew pretty much everyone because you passed them as you walked to the bus/tram. You always said hello to those you passed. Hospitals: Queensland had a public hospital system funded by the Golden Casket. There was no Medicare for all. The effects of World War II were still evident around town in the men’s physical injuries – empty sleeves or trouser legs pinned up and prostheses. Their mental injuries weren’t so evident except perhaps in the occasional drunk seen on the street. Image from Microsoft Images Online. Daily Transport: we didn’t own a car until I was 20 so getting around town involved shanks’s pony (walking), bus, tram or train. Standing up and offering your seat to an adult or pregnant woman was totally non-negotiable. My Dad rode to work, hail, rain or shine, on his no-gears push-bike. Air Travel was expensive and not available to most. I didn’t fly in a plane until I was 19 (with a friend who was a pilot), and on a commercial flight at 21. I’ve been on and off planes like buses ever since. Holiday Transport was by intra-state train. Those taking the semi-obligatory trip to the “Old Country” for a year or two’s work experience travelled by ship. As the ship pulled away from the wharf there were streamers held by passenger and friend which snapped as the distance grew. Very symbolic. 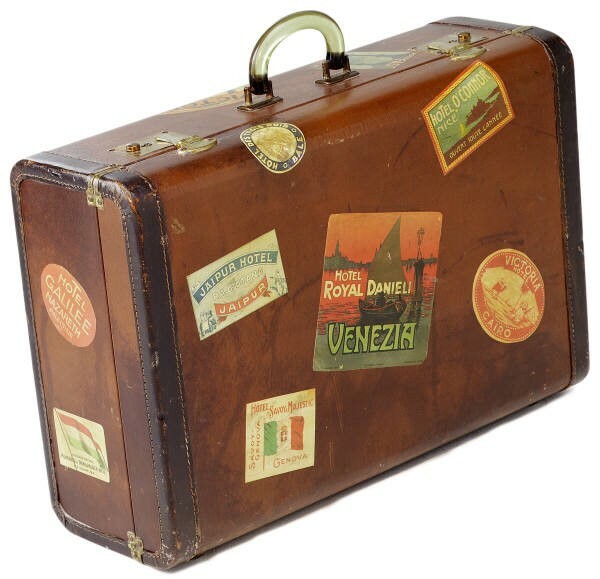 Overseas Travel was a fantasy for most people. Only our one family of “rich relations” had travelled overseas. The Brisbane city skyline as I finished school. From my photo collection. Brisbane’s first Freeway was still a few years away. Space travel was a recent competition between Soviet and America (US) astronauts and scientists. The Soviets were leading the way but the US was yet to put Apollo 11 and the first man on the moon. The Brisbane City Hall clock tower was still holding its own as one of the highest buildings and you could read the time from it around the streets. Illustrating Jill’s point, dressed for town or church with gloves, hat and patent leather shoes. Shopping malls didn’t exist. You went to the city or Fortitude Valley when shopping for clothes or household goods. My mother used to like to walk the length of Brisbane from Finney’s to McDonnell & East to check the items and prices. We were “allowed” to catch the tram or bus to the city from the Valley. Going to town always involved getting “dressed up”, no informality in those days. Parcels at the good shops were wrapped in brown paper and tied neatly with string, with a loop to make it easier to carry. Technology: TV and radio were our main technology. There were no cable TVs, DVDs, VCRs, fax, internet, computers, iPads, MP3s, cassette players, tape recorders, answering machines, or mobile phones. Colour TV was still on the horizon. Records were 78s or 33s (LPs) and small 45s. 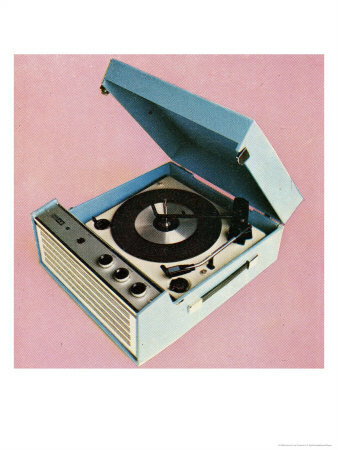 If you were lucky you had a record player in the house, either a family one or a portable one, which was likely a gift. My grandmother owned a gramophone which I have inherited. Postage: If you wanted to share news with someone you had limited choices: letters for ordinary events, postcards for holiday news, and telegrams for urgent news or special celebrations. The postman (it was always a man) walked his route twice a day delivering the mail and blew his whistle if you had mail. On hot summer days it was a common courtesy to offer him a cold drink. 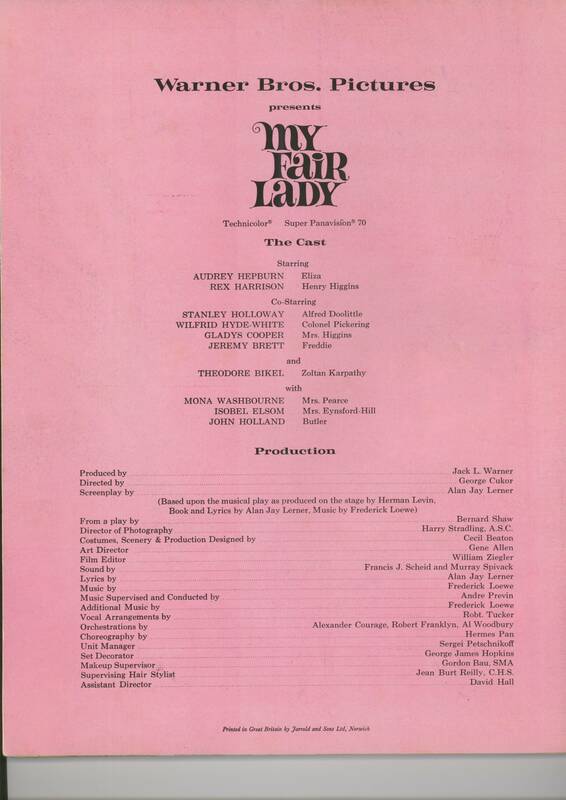 My copy of the “My Fair Lady” Programme. Telegrams were delivered to your door and if you knew it was a birthday or you were sharing exam results with people it wouldn’t strike fear into your heart as one would if “coming out of the blue”. Entertainment: There were no multiplex cinemas and you “went to the pictures” in town or at a local theatre. Stage shows were something special. Both movies and theatre offered published programs with pictures and stories about the actors and the movie/show. There was always an interval in the movie and young women walked through the theatre selling lollies and ice-creams. Cameras and watches were something special: reserved for adults, and fortunate children, but often to recognise a special birthday or achievement. Food: Meals were cooked from scratched. Roast chicken was expensive, unless you had your own chooks and was often a Christmas and Easter special meal. Baking in our house was a Saturday event. The only take-away, very occasionally, was fish and chips. When I was about 18, Mum & I occasionally ventured to the Valley to a Chinese restaurant where we had exotic meals like sweet and sour pork and stir-fried rice. I don’t recall Mum and Dad ever going out for a restaurant meal, partly because of his shift work. Ingredients: Fruit and veg were basic and chokoes were deemed to be a reasonable option for preserving or vegetables. 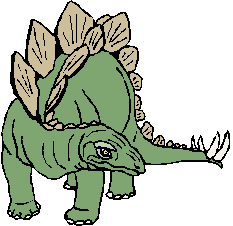 Avocadoes, mushrooms, zucchini, unusual herbs etc were in the future. Many of these I first “met” when I worked in a fruit and veg shop as a part-time job. Bread was always white and fluffy, and also fresh from the bakery. I remember even in my 20s it was a challenge to find coconut milk in Brisbane (they had it at Toowong Woolworths). 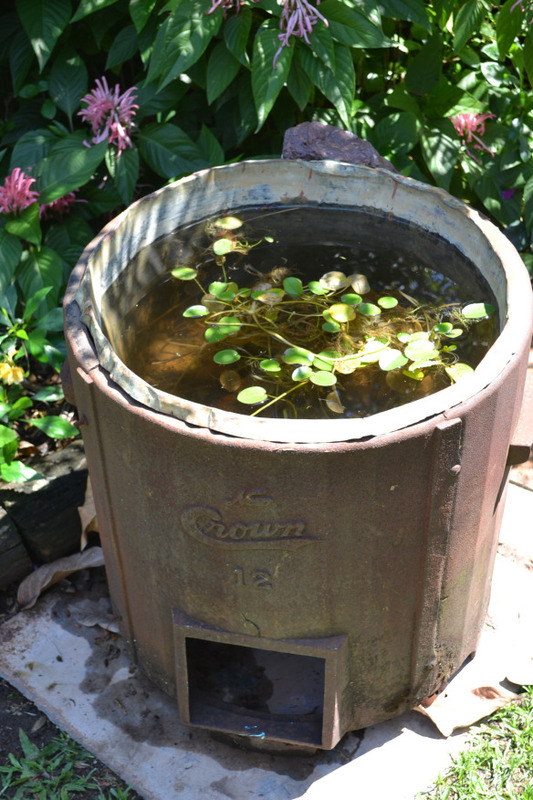 An old laundry copper recycled as a water feature in the NT. Photo P Cass. Glad Wrap/ Cling Wrap hadn’t arrived and sandwiches were wrapped in greaseproof paper. Telephone: Most homes near us didn’t have one. Those who did would take urgent messages for friends who lived close by, otherwise you used the local public phone or wrote letters. Laundry Day was always Monday and was a heavy-duty workload with coppers, wringers and hand-washing. Twin tub machines were a grand invention and automatic washing machines in our future. Corner Stores: we had a corner store for the basics and a butcher’s shop a couple of streets away. I have no idea where the groceries came from or how they were delivered. A cart came around sometimes with bread and fish. Appliances and housework: The Sunbeam mixer, the pressure cooker, and carpet sweeper were “it” as far as appliances went. Mum was always the dishwasher, and I was the dryer. Dad mowed the lawn, looked after the garden and mended the shoes. Boys and girls in private schools were not permitted to speak to each other on public transport, even siblings….a fine excuse! Make up was reserved for the mid-teens and was a ritual of passage unless you were playing “dress-ups” as a child. Books were special purchases, usually only for birthdays or Christmas, or perhaps when you were sick because they were expensive. Your friends lived in your own neighbourhood, unless/until you went to high school in the city. No one drove you to meet them, no matter where they lived, you caught public transport. University was a dream for many people but the newly-introduced government scholarships made it possible for working class kids who studied hard. I met my beloved Mr Cassmob and my life changed in ways I’d never have imagined. No, didn’t see any of those around there, even though this all sounds like light-years away. I’d love to hear your comments on whether your experience differed from mine, and in particular from younger readers. This entry was posted in Brisbane, Family History, Kunkel Family History, Queensland and tagged Brisbane, Kunkel by cassmob. Bookmark the permalink. Australia wasn’t the only ones worries about the Reds Under the Beds and Oh, how we thought LBJ would cure things – HA. People talk badly about Nixon, but he not only brought our guys home, but it was the best economic era I’ve had (outside of the ’60s). It’s interesting how our perceptions of leaders change with the distant perspective of time isn’t it? 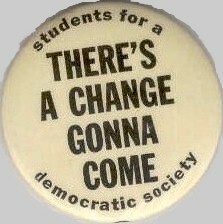 Well, we can also look back with hindsight and the assistance of archives. It’s difficult not to bring personal perspective into recent events though isn’t it? My friend and I have wildly, and widely, diverging views of some of Australia’s political activities. Today’s 18-year-olds (even more so 8-year-olds) would read this with goggle eyes. Lovely post, Pauleen, with your usual sene of humour. Thanks Pauleen. You’ve dredged up so many memories and told them beautifully. I remember refusing to go inside an Anglican Church for a family Christening because it was sinful but I could never understand why pPotestants were people to be feared as my Protestant mother seemed all right to me. Clothes were another thing I remember. 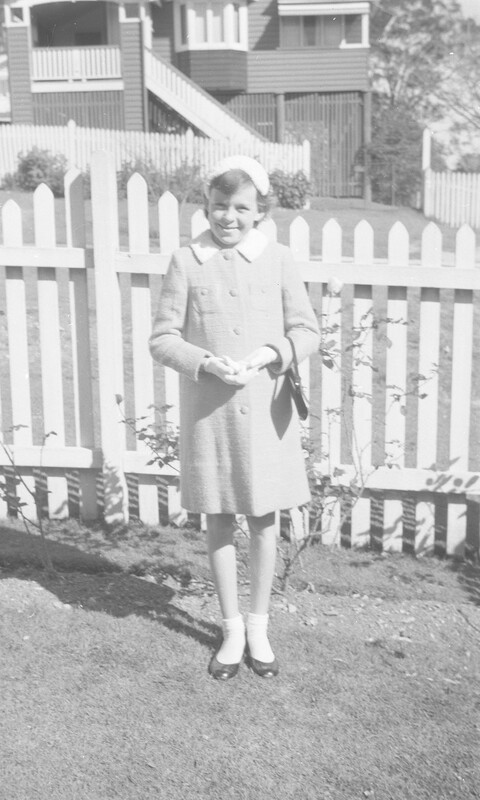 As a little girl I wore a hat and had gloves for church on Sunday and trips to town. We always wore proper leather shoes.When Dunlop Volleys appeared they were the must have shoe for school sport and tennis. I refused to wear trousers because the nuns told us it was sinful to do so, as I didn’t want to be a sinner I also stuck to one piece swimsuits. Inspired by your memory I’ve added a photo which I think perfectly illustrates your point about our clothes. Then last night watching Foyle’s War I remembered I’d wanted to mention all those men with war injuries, so I’ve put that in as well. Some of your memories were very similar to mine – friends in the neighborhood, walking or taking the bus, wearing gloves and dressing up to go downtown, I wasn’t Catholic so I didn’t have the nuns and growing up in Detroit there were plenty of brown faces about. I do remember going as a family to a nearby Chinese restaurant. My mother and I would order Chinese food and my sister and father would order the turkey dinner!